The Information Centre for Lake Pamvotis opened last May in the Nissi village on the sole island of the lake, near Ioannina in Greece. It is housed in a traditional old building that was renovated for the purpose. The Centre is providing visitors with information about the lake and the surrounding area. Its design, the museological and museographic planning is by Tetragon Ltd. (the company I work for). Official contractors for this project are Tetragon Ltd, OIKOM Environmental Studies and OIKOS Nature Management, with the invaluable cooperation of the Management Authority of Lake Pamvotis. When going through the main entrance, one can see the reception area while on the right is the room dedicated to traditional fishing. 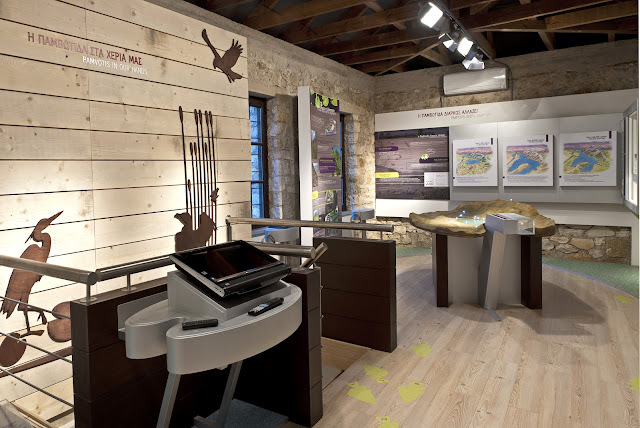 The permanent exhibition about the lake is located on the first floor. Going up the stairs and exactly opposite them is a segment that has extensive information about lake Pamvotis - the environment, the area in which it lies, its long geological history. On the left you can see a large model of the lake that attracts the attention of visitors. 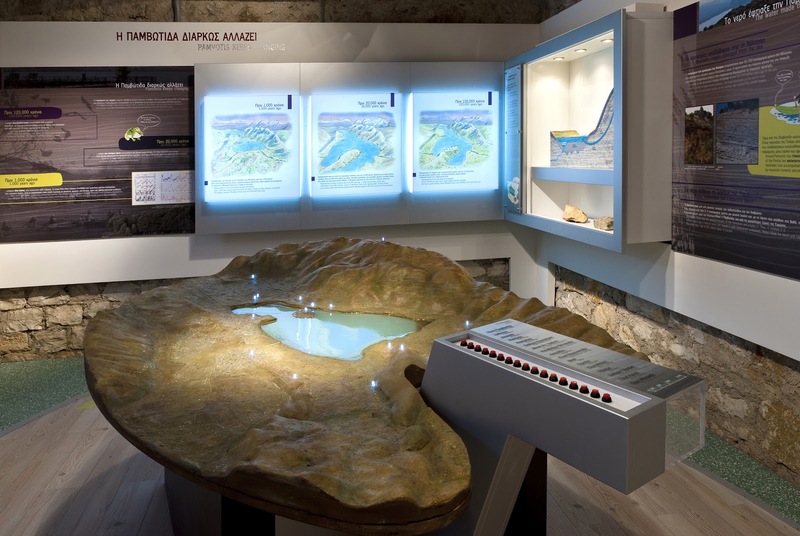 Near it, and following from the previous section, the visitor can discover, through text and a smaller model, information about how the system of the lake operates: the origin of the water, how it was created and the movement of water into the lake. On the far left wall are three bright diagrams showing the shape of the lake in its long life. The large and impressive model of the lake reflects its current form. Pressing the buttons light up lights for points of interest. Right next to the window is a table shaped like a water-lilly leave with a pair of headphones. Wearing them, the visitor can hear various myths and old stories about the lake and the surrounding area (the voice doing the English narrative is by yours truly). And right after this is the section dedicated to the lake ecosystems. Here the influence of water on vegetation in the area is examined. The section continues to the other side of the stairs, where plexiglass lecterns emerge from brightly lit blue floor. Each of these provides information about the main lake plants, reeds and water lilies, but also how they form peatlands. Above the desks and at eye level is a large screen, which displays a slideshow about Pamvotis. It is extremely interesting and does not last long (I made this!). 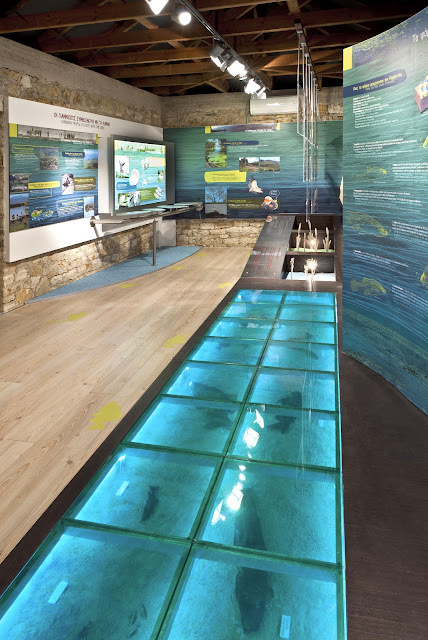 To the left of the screen and into the blue lit floor that resembles the water of the lake, visitors can see the types of fish that live in it. Carp, Eels, butterfly fish, cut in natural size, are "swimming" in the blue-green "water," while on the back plate you can read more about them. On the floor, you can see the grypos fishing tool and hung from the ceiling is another one named pezovolos: two traditional ways of fishing here. At the back of the room, one can observe different species of birds and animals that live in the lake and around it. The impressive composition suspended from the roof, makes it easy to identify the characteristics of the local fauna species: crayfish, ducks, egrets, frogs etc. 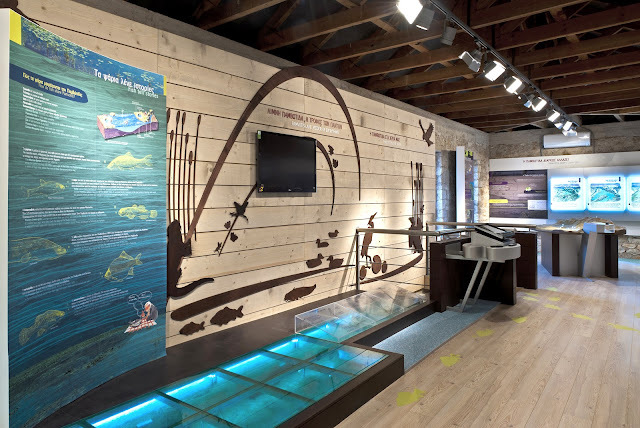 At the end of the hall there is a large section informing the visitor about the human impact on the lake and the ecosystem. Also you can see how locals live from the Ioannina lake - fishermen, craftsmen, merchants and all people are affected directly or indirectly from it, while in turn they affect it too. 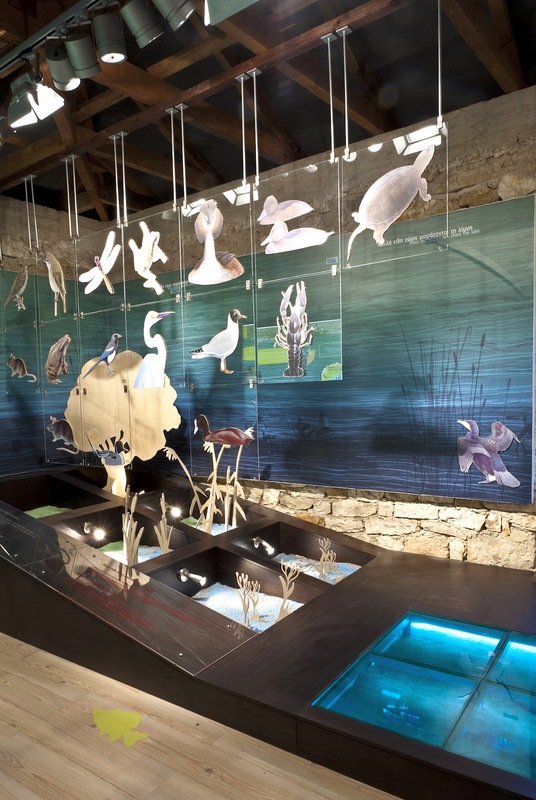 Towards the end of the exhibition, the visitor can read the corresponding panels about how the lake has been a refuge since prehistoric times for humans and animals, something that continues to the present day. The lake was also a natural crossroads for shepherds, armies, merchants. In the last section you read that the future of the lake is in our hands and how its management affects the surrounding area. Just before the staircase is a beautiful structure with a screen where you can see suggested routes for small excursions, to get a more complete picture of the lake and its surrounding area. If you happen to visit Ioannina, do not miss it! Photos by Dinos Michail, courtesy of Tetragon Ltd except the last one by Alexios Pissaridis.